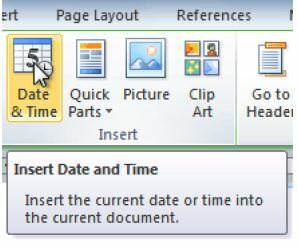 Write steps to insert date and time in header and footer simultaneously in MS-Word. 1. Double-click anywhere on the header or footer to unlock it. The Design tab will appear. 2. From the Design tab, click the Date & Time command. 3. Select a date format in the dialog box that appears. 4. Place a check mark in the Update Automatically box if you would like it to always reflect the current date.Otherwise, it will not change when the document is opened at a later date. Write the steps to create Jtable WAP to create a table with the column headings Name USN age address insert records and display? C onsider an IP packet with a length of 4,500 bytes that includes a 20-byte IPv4 header and a 40-byte TCP header. The packet is forwarded to an IPv4 router that supports a Maximum Transmission Unit (MTU) of 600 bytes. Assume that the length of the IP header in all the outgoing fragments of this packet is 20 bytes. Assume that the fragmentation offset value stored in the first fragment is 0. The fragmentation offset value stored in the third fragment is _______.